it's snow-covered forests and towering mountains. Here, you will find yourself in a unique environment, 680 km. north of Stockholm, on the ice track in Vilhelmina. We offer the automotive industry test drives and driver training courses, but also activities like Crosscart and 5-martial. You will enjoy Northern Sweden's specialties, served in Moskosel tipi, while relaxing by a cozy fire. 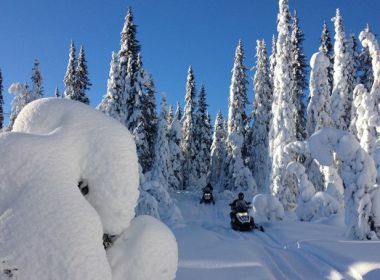 We offer magnificent scenery all year round, snowmobile tours through the snow covered forests and majestic mountains, with the possibility to fish or why not experience the rushing rapids and natural hues with quadbike. Do you want to challenge each other in a pentathlon? You are welcome to Krontjärn Event Camp where we offer a wide variety of activities such as archery, a track for practicing different techniques on a quadbike and in the winter we have activities at the ice track and of course a sauna and hot tub. Your guides will welcome you at the airport and then head off to the Hotel Vilhelmina where a delicious dinner awaits you. We will provide you with winter and protective clothing, accessories and a short presentation of the snowmobile. We will guide you then on a journey through snow covered forests and rugged mountains. The lunch will be cooked over an open fire enabling you to enjoy the magnificent views. When darkness falls, it is possible that you may also get to experience the northern lights. After a full day out we can relax in the wellness area before enjoying a delicious dinner. We head to the ice track situated on a frozen lake in Vilhelmina. 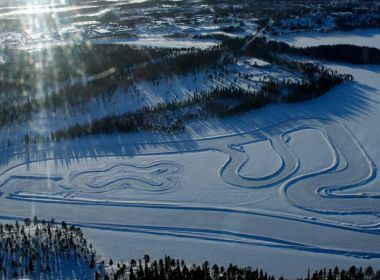 Here we offer Cross cart, quad bikes, and cars with different types of tyres for driving on the ice, ice bowling, golf, and a variety of activities to try out or for those who wish to divide into groups and challenge each other a pentathlon. The day ends in the relaxation centre and then dinner with Lapland specialties. Breakfast and then departure to the airport. 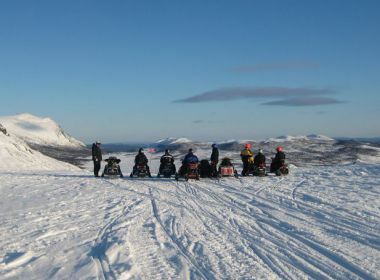 Experience the nature of Southern Lapland by snowmobile, it's snow-covered forests and towering mountains. We will guide you on a journey through magnificent scenery on well groomed snowmobile trails; for those who prefer a backcountry experience, we can take you directly into the wilderness. We offer everything from one to five day tours, the tempo is adjusted to suit the group's experience is not a requirement for participate. Your guides will welcome you at the airport and then head off for a delicious dinner with an overnight stay where we are looking forward to the following days experiences. We will provide you with winter and protective clothing, accessories and a short presentation of the snowmobile. We will guide you then on a journey through snow covered forests and rugged mountains. The lunch will be cooked over an open fire enabling you to enjoy the magnificent views. When darkness falls, it is possible that you may also get to experience the northern lights. The day ends with a soothing sauna, outdoor hot tub and dinner. We will guide you through magnificent scenery and will be stopping in a terrain that suits itself well to try walking with special snowshoes, then we cook lunch over an open fire. You can enjoy a stunning landscape at the lookout point where we can see for 100's of kilometres. The day ends with a sauna and dinner with Lapland specialties.